AED, Inc. performed the structural design for a steel-framed support tower to be located in Dubai, United Arab Emirates. The tower is approximately 55’ high with 5 levels and a footprint of about 20’ by 23’. 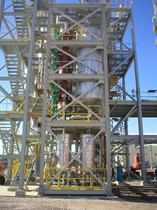 The purpose of the tower is to support various mechanical equipment for a perlite production facility. The tower is designed to meet the 2009 International Building Code as this code is acceptable for design standards in the United Arab Emirates. A uniform load of 120 PSF was applied to the structure plus the loads exerted from the equipment. Wind speeds utilized for design were 100 MPH. The structure is an open-framed tower (not enclosed) with a combination of steel cross-bracing and moment connection frames to resist the lateral loads. The tower is designed to be enclosed at a later date if desired by the owner. The overall displacement of the tower is calculated to be below 1.5 inches (when enclosed).